Double Take Fashions Studio For Men and Women offers a vast array of fashion choices for people with individual styles, tastes, and preferences. It is our duty to help our customers make the ideal fashion statements based on their personalities. As a forward moving company, we do not believe in setting any limits as to how people should express themselves through garments, fabrics, and accessories. We want our men and women clients alike to feel comfortable and empowered with what they’re wearing, constantly drawing attention at any event or in any occasion they attend. Sir Alfred Moody has been servicing the Houston Area for over 30 years as one of the top hair stylists. 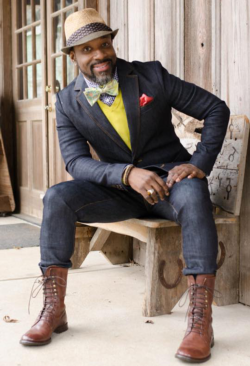 While continuously serving as a hair stylist, he has been fortunate enough to pursue a passion as a fashion consultant for the many women and men of Houston, Texas and its surrounding areas. Over the years, he has received several inquiries as to where he purchased his clothing pieces and has been offered continuous encouragement to pursue a career in fashion. Through these many affirmations, the vision of his very own clothing store came to life on September 7, 2010 and Double Take Fashions Studio was birthed! Starting out, he removed all the furniture in his living room, brought in several racks, and with an abundance of prayers and a whole lot of faith, is still running a successful business 7 years later with Double Take Fashions Studio For Men and Women. On December 4, 2016 Double Take Fashions Studio was blessed to opened up its very own store front to serve the many clients of Houston and its surrounding areas. Sir Moody’s goal is to make the men and women who leave his store feel fearless and empowered through the garments they put on. Each unique piece is reminiscent of one’s personality and assists in bringing out the edge that lives within them. The store offers a variety of fashion forward, unique, classic clothing, jewelry, and accessories for men and women of all ages, sizes, and backgrounds. Each piece in Double Take Fashions Studio For Men and Women is handpicked with love by Mr. Moody. He and his staff are here to cater to whatever the occasions you have going on in your life from weddings, proms, vacations, or any special event, providing a unique personal touch that ensures style, grace, and class in any occasion you step into and earning you a DOUBLE TAKE from everyone who catches a glimpse of your utter brilliance. For inquiries, don’t hesitate to get in touch with us today. You may reach us through the information provided on our Contact Us page.